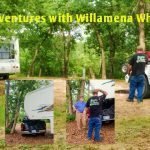 One of the most asked questions I get as a full-time RVer is “Why did you choose a fifth wheel trailer instead of a motorhome?” Rather than constantly rewriting the same answer over and over again, I thought I would consolidate my reasons into a blog post to share. 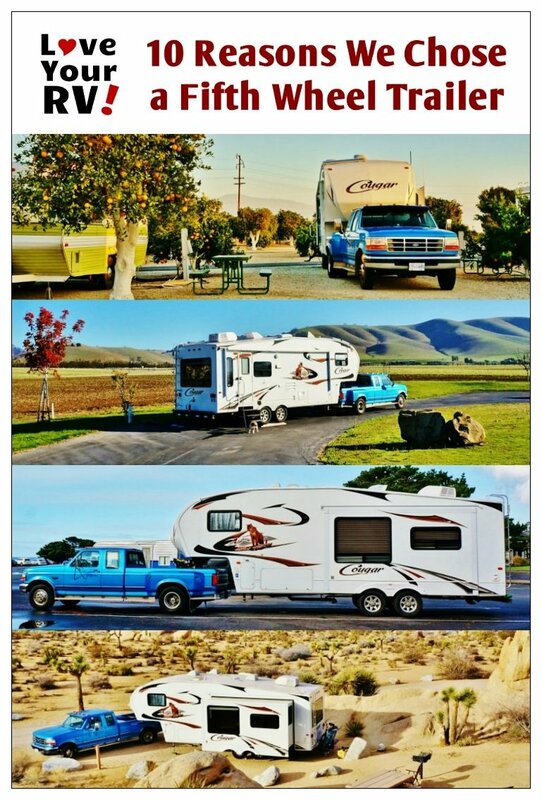 When buying our RV we checked out many rigs and weighed all the pros and cons before settling on our 2011 Keystone Cougar 276RLS and Ford F350 DRW Truck. 5 years later we are very pleased with the choice and as full timers prefer the fifth wheel trailer over other options. 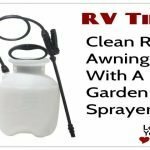 I’ve spoken to many other RVers who love their Class A B C or travel trailers. It’s truly a personal RV lifestyle preference. With that in mind here are my top 10 reasons for picking a fifth wheel trailer and truck combo as our full-time rig. We had an original budget of $45,000 for our rig. We were able to buy a brand new fifth wheel trailer and an older but mint condition 1-ton diesel truck for less than that even. If we had tried to go with a Class A or even Class C motorhome it would have been fairly old with a potential to turn into a money pit. Plus some kind of small tow vehicle would be required. Insurance costs tend to be less with a truck and trailer as opposed to two powered vehicles. Comparing apples to apples (28 feet long and a single slide out) I don’t find any other RV types roomier than our fifth wheel trailer. Being I’m 6 feet tall the high ceilings, in some places 8 feet, make a huge difference and really open up the place. The same length motorhome loses a bit of space eaten up by the front dash area. See the recent renovation wrap up post for a look inside. All the expense and maintenance hassles are times two with the motorhome & towed vehicle combo. This is especially true for me. I like to do as much of the vehicle maintenance tasks as I can. Having only the older diesel truck to worry about versus a complex motorhome and small car simplifies things a great deal. There are less moving parts to cause us a breakdown on the road. 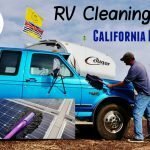 Because a motorhome combines the engine, drivetrain and regular vehicle electronics with the RV systems its much more complex than a trailer. I love to do mods/upgrades and repairs on our rig. 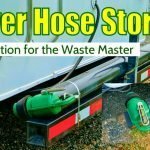 Having only the basic fifth wheel electrical, propane, and plumbing to consider I find it much simpler to work on with less chance of inadvertently causing damage. 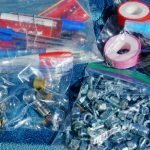 With a motorhome, I would have all the regular vehicle wiring and mechanics to worry about. Our trailer has a large pass through basement storage area plus a roomy front compartment. Because of the taller interior, a fifth wheel trailer has extra storage areas up high not found in a travel trailer or motorhome. 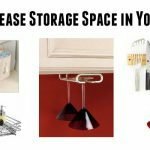 Our Cougar takes great advantage of this, especially in the kitchen area. Even though the truck has a large hitch on it with the 8-foot bed there is still enough room for two large tool chests. Storage space was high on our list when RV shopping and a big reason a fifth wheel trailer fit the bill. It’s a personal preference but I’ve always liked to drive a larger vehicle like a truck or van. I’d feel a little safer in an accident and other drivers tend to respect your size. Built with mostly steel and tipping the scales at over 7000lbs it’s going to take a serious crash to injure us badly. It’s something to consider when you are like us often traveling out of your home country relying on extended health insurance in case of hospitalization. With the heavy duty construction of our 1-ton diesel, I’m less fearful of damage when out exploring off road areas. Some of the roads can get pretty rough; many smaller vehicles just aren’t built for the abuse. Finally, the truck is needed to tow my wife’s boat around when summering on Vancouver Island. Saves us the hassle of renting one every time it needs to be launched or moved. When I was shopping for a potential RV I noticed that the fifth wheels came with some of the largest waste and water tank capacities. For instance, our roughly 28-foot Cougar has a 60 gallon fresh water tank and three 40 gallon waste tanks. We wanted to do lots of dry camping during our annual 6-month snowbird trips so the more the better. If our truck needs to go in the repair shop for an extended stay, at least, we have all of our stuff and familiar home to be in while we wait. 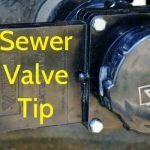 Sometimes motorhome owners are able to keep living in theirs if the shop allows it but other times a trip to a motel may be in store. If they have a pet like us it complicates things even more. Because of its heavy pin weight and the hitches placement right over the (dually) axle of our heavy duty 1-ton truck towing our fifth wheel trailer is very stable. I have no problem with sway and other than degraded fuel mileage wind has a marginal effect on handling. Our fifth wheels front nose is quite rounded so slips through the air much better than a flat fronted RV. Most motorhomes towing a small car need to be very careful when heading down an unknown road just in case it dead ends without an adequate turn around space. Because of the tiny towing setup, it becomes too easy to jack knife the towed vehicle causing possible damage. So they are left with having to disconnect and back out the rig separately. With a fifth wheel or travel trailer, it’s simple enough to just back it out. Instant backing up capability can be very handy when fueling up in smaller, busy stations or quickly grabbing a back-in campground site making life on the road a little easier. Our fifth wheel trailer has less security. 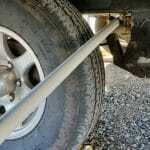 With more steel in the construction, motorhomes (for the most part) are harder to break into. If threatened, you can always jump into the driver’s seat and leave the scene. When towing a long steep hill where overheating may be a concern motorhomes can unhook and drive the tow vehicle separately to reduce overall weight. 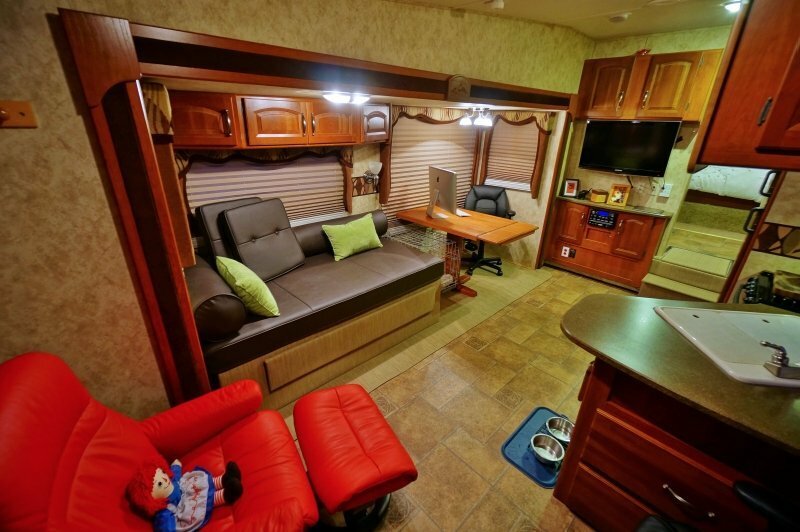 Class A motorhomes have huge storage compartments underneath with large weight capacities. Motorhomes owners towing a secondary small vehicle save on fuel versus our large truck when unhooked. 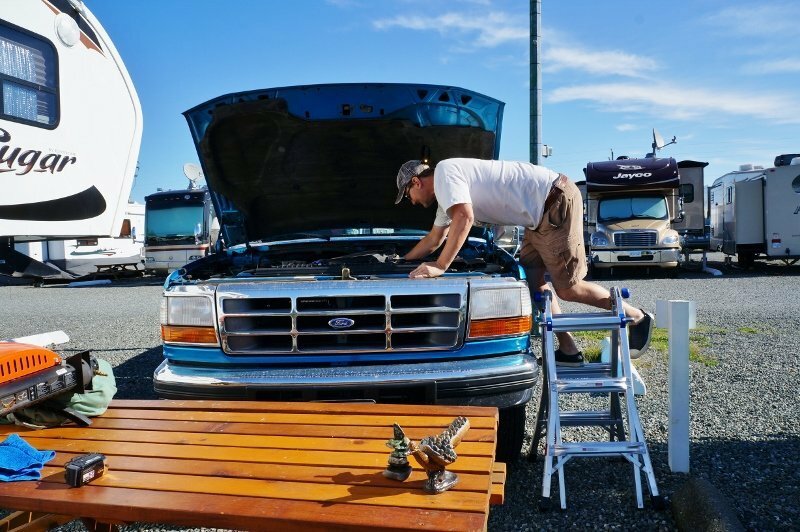 If your main motorhome engine breaks down on the road, you have a backup and are not stranded. Motorhomes are generally easier to setup at campsites. Most motorhomes have a built-in generator or can efficiently charge the coach batteries off the engine. Access to the kitchen, bathroom and bedroom while you’re moving. 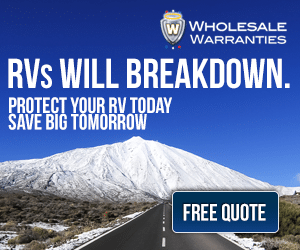 Is RV Tow Insurance Part of Your Risk Mitigation?